The router or admin password is used to access the web-based setup page or the user interface (UI) of your router for configuration and settings update or verification. The default password for Linksys routers is admin. For optimum security, it is recommended to change this password during setup. To learn how to do this, click here. The wireless password or passphrase (also known as network security key) is different from the router or admin password. The router or admin password is used to log in to the router’s web-based setup page for configuration or verification purposes while the wireless password is used to connect wireless devices to your wireless home network or hotspot. 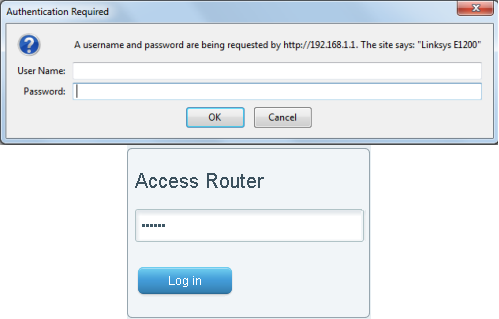 The Guest network is a feature of the router that creates a separate and secured network for guests. In order to connect to the Internet, guests will be required to enter the Guest password once they open a web browser. The Guest password is different from that of the main wireless network. The Linksys Smart Wi-Fi (LSWF) password is the password used (together with the Email Address that you registered for an account) to remotely access the user interface of your Linksys Smart Wi-Fi Router. When accessing the Linksys Smart Wi-Fi page from your local network, you can either use the Router Password or the LSWF password to get in.